Just a quick reminder that our February WiN meeting will be Thursday, February 7th. 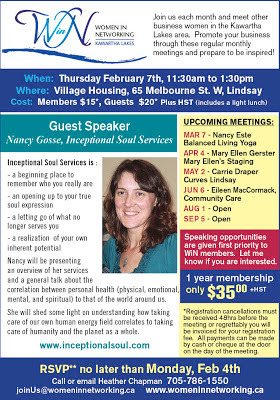 Our guest speaker will be Nancy Gosse of Inceptional Soul Services. She is a Lightworker, Spiritual Counsellor and Author. Full details are below. Please forward to anyone you think might be interested in attending. Please reply via email by end of day Monday, Feb 4th if you are planning to attend.